Galen Samuel Hall (born August 14, 1940) is an American college and professional football coach and former player. He is a native of Pennsylvania, and an alumnus of Penn State University, where he played college football. Hall was previously the offensive coordinator at the University of Oklahoma and the University of Florida, and the head coach of the University of Florida, the Orlando Thunder, the Rhein Fire, and the XFL's Orlando Rage. He most recently served as the offensive coordinator at his alma mater, Penn State. Hall was born in Altoona, Pennsylvania in 1940 and grew up in Williamsburg, Pennsylvania. He was raised by his grandparents, following the death of his father several months before he was born. He attended Penn State University in State College, Pennsylvania, where he was the starting quarterback for coach Rip Engle's Nittany Lions in 1960 and 1961. He led the Nittany Lions to a combined 15–6 record and victories in the 1960 Liberty Bowl and 1961 Gator Bowl. Hall was also a member of Delta Upsilon fraternity while a Penn State student. Hall had a short stint as quarterback in the National Football League (NFL) in 1962, during which he appeared in three games with the Washington Redskins. Afterward, he played for the New York Jets of the American Football League (AFL) in 1963. Hall appeared in thirteen games that season, completing 45 of 118 pass attempts, including his only start, a 48–0 loss late in the season against the Kansas City Chiefs. Hall served as offensive backfield and ends coach for West Virginia University from 1964 to 1965, in 1966 he joined the University of Oklahoma staff as receivers coach and was the offensive coordinator there from 1973 to 1983. During that time, the Sooners boasted one of the most prolific offenses in college football, predominantly using the wishbone attack, won two national championships, and produced Heisman-winning running back Billy Sims. After a disappointing season in 1983, Oklahoma replaced many assistant coaches while retaining head coach Barry Switzer. Hall was let go, but was quickly hired to be the new offensive coordinator for the Florida Gators to replace Mike Shanahan, who had left Florida for the NFL. Hall installed a conventional I formation offense at Florida under head coach Charley Pell for the 1984 season. However, between the third and fourth games, Pell was fired after an NCAA investigation alleged 107 violations of NCAA rules. Hall, who had not been at Florida when the violations occurred between 1979 and 1983, was made the interim head coach by athletic director Bill Carr. The Gators won the remaining eight games on their schedule under Hall, including big wins over arch-rivals Auburn, and Florida State, and finished with a 9–1–1 record. By virtue of an undefeated 5–0–1 conference record, Florida won its first-ever Southeastern Conference (SEC) football championship. The team finished the season ranked No. 3 in the AP poll, the team's highest ever ranking up to that time. However, the SEC refused to allow the Gators to play in the Sugar Bowl; LSU went in their place. Two weeks after the end of the season, the NCAA slapped the Gators with two years' probation (a third year was later suspended) and banned them from bowl games and live television in 1985 and 1986. The most damaging sanction in the long run, however, was a limit of 20 new scholarships in 1985 and 1986, and a reduction to 85 total scholarships in 1985 and 75 in 1986. Nonetheless, the Gators were crowned national champions by several minor polls, including that of The New York Times. Hall was named the Associated Press Coach of the Year and university president Marshall Criser named him the permanent head coach at the end of the season. On May 30, 1985, the SEC university presidents voted 6–4 to vacate Florida's 1984 SEC title and make the team ineligible for the conference title during the upcoming 1985 and 1986 seasons because of the rule violations committed under Pell, overturning an executive committee ruling that allowed the Gators to keep their 1984 title. The decision drew much anger from Criser and Gator players and fans due to its retroactive nature. Despite the sanctions, Hall's 1985 Gators would again go 9–1–1 on the field and tie for the SEC lead with a 5–1 conference record, but could not claim the conference title because of NCAA and SEC probation. The 1984 and 1985 seasons are remembered as "Best in the SEC" years for Florida football. However, Hall's subsequent Gators teams were hamstrung by the severe sanctions imposed for violations under Pell, including scholarship restrictions that severely limited the team's number of scholarship players. Hall's first two recruiting classes only had 25 players. His teams typically featured strong defense and a solid rushing attack (especially with record-setting running back Emmitt Smith). The sanctions began taking their full effect midway through Hall's tenure, however; between 1986 and 1989, Hall's Gators never won more than seven games in a season, and never won more than four games in SEC play. Even with the burden of the sanctions hanging over them, Hall's teams remained competitive; they never suffered a losing season overall and only had one losing SEC record. Interim university president Robert A. Bryan forced Hall's resignation in the middle of the 1989 season during another investigation of possible NCAA rule violations. The new allegations were primarily related to Hall paying several of his assistants out of his own pocket (violating an NCAA rule that capped salaries, a rule later found to be in violation of federal antitrust laws) as well as paying the legal expenses related to the child-support obligations of one of his players, allegations that he still denies. The NCAA ultimately slapped the Gators with two years' probation, and banned them from bowl consideration for the 1990 season. It deemed Hall's alleged violations serious enough that it would have kicked the Gators off live television during the 1990 season as well had school officials not forced Hall's resignation. Hall has not been hired as a college head coach ever since—and indeed, wouldn't return to the collegiate ranks again in any capacity for 15 years—prompting later employer Joe Paterno to call him "a good coach who got screwed". In 1992, Hall was the second head coach of the Orlando Thunder of the World League of American Football. He coached the team to an 8–2 record before losing to the Sacramento Surge in the World Bowl II championship game. In 1994, Hall became the head coach of the Charlotte Rage of the Arena Football League. He led the team to a 5–7 record, and a spot in the playoffs. He went on to become head coach of the Rhein Fire in NFL Europe from 1995–2000, leading the team to three World Bowl berths, including NFL Europe championships in 1998 and 2000. He is the second-winningest coach in NFL Europe history with forty-four victories and was selected Coach of the Year three times. In 2001 Hall was named head coach of the XFL's Orlando Rage, posting a league-best 8–2 record before losing in the first round of the playoffs. He was named XFL Coach of the Year that season. He was reunited with former Florida running back Emmitt Smith while serving as running backs coach for the Dallas Cowboys in 2002. In late 2004, Hall returned to his alma mater, Penn State, to become the offensive coordinator and running backs coach under head coach Joe Paterno, who had been an assistant coach at Penn State during his college days. The Nittany Lions were coming off of consecutive losing seasons, but finished the 2005 slate with an 11–1 record and a share of the Big Ten Conference title behind a much-improved offensive attack. They would win nine games in 2006 and 2007, and won the conference title in 2008 with another 11–1 record, earning a trip to the Rose Bowl and fielding one of top offenses in college football. Paterno was ousted in the middle of the 2011 season, and his successor, Bill O'Brien, opted not to retain Hall. Florida: 40–18–1 21–12 * SEC championship vacated. ^ a b " Collected Wisdom: Galen Hall," The Oklahoman (March 1, 2009). Retrieved March 16, 2010. ^ Larry Guest, " Hall's head coach, Carr says." The Evening Independent, p. 1-C (November 16, 1984). Retrieved May 4, 2011. ^ a b Mike Bianchi, " JoePa gets a big boost from former Gator coach Galen Hall," Orlando Sentinel (October 17, 2008). Retrieved March 16, 2010. ^ a b Jack McCallum, " Gatorgate May Be The Real Gatoraid," Sports Illustrated (November 19, 1984). Retrieved March 20, 2010. ^ a b Pat Dooley, " Ex-Gator coach Hall deserves respect," The Gainesville Sun (December 29, 2010). Retrieved June 9, 2011. ^ College Football Data Warehouse, Florida Coaching Records. Retrieved March 4, 2010. ^ a b c d e 2012 Florida Football Media Guide, University Athletic Association, Gainesville, Florida, pp. 112 & 116 (2012). Retrieved September 16, 2012. ^ GoPSUSports.com, Penn State Football, Galen Hall Profile. Retrieved March 16, 2010. ^ Associated Press, " SEC Presidents swipe Florida of football title," Times Daily, p. 5B (May 31, 1985). Retrieved May 4, 2011. 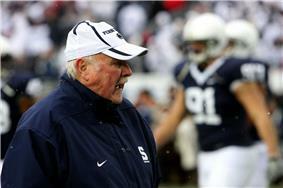 ^ a b c Donnie Collins, " PSU's Galen Hall recalls Florida days," The Scranton Times-Tribune (December 31, 2010). Retrieved May 4, 2011. ^ Associated Press, " Florida Football Coach Quits," The New York Times (October 9, 1989). Retrieved February 8, 2011. ^ All-XFL.com, " Galen Hall named XFL Coach of the Year." (April 19, 2001). Retrieved March 16, 2010. ^ NCAA, Football, Bowl Subdivision (FBS) National Team Report: Total Offense. Retrieved March 16, 2010. ^ Sports-Reference.com, College Football, Coaches, Galen Hall Coaching Record. Retrieved May 4, 2011.